Artwork: Cover painting by Darrell Sweet. Maps by Ellisa Mitchell. Interior illustrations by Matthew C. Nielsen and Ellisa Mitchell. 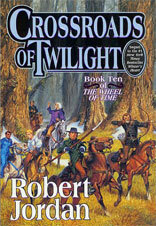 In the tenth book of the Wheel of Time, from the New York Times #1 bestselling author Robert Jordan, the world and the characters stand at a crossroads, and the world approaches twilight, when the power of the shadow grows stronger. Perrin Aybara seeks to free his wife, Faile, a captive of the Shaido, but his only hope may be an alliance with the enemy. Can he remain true to his friend Rand, and to himself? For his love of Faile, Perrin is willing to sell his soul. In Andor, Elayne Trakand fights for the Lion Throne that is hers by right, but enemies and Darkfriends surround her, plotting her destruction. If she fails, Andor may fall to the Shadow, and the Dragon Reborn with it. Rand al'Thor, the Dragon Reborn himself, has cleansed the Dark One's taint from the male half of the True Source, and everything has changed. Yet nothing has, for only men who can channel believe that saidin is clean again, and a man who can channel is still hated and fearedeven one prophesied to save the world. Now Rand must gamble again, with himself at stake, and he cannot be sure which of his allies are really enemies.